2008 British Indoor Rowing Championships. Photo by Peter Spurrier. WHAT: Community Rowing, Inc.’s inaugural Youth Erg Trials International – YETI — competitive event for Boston-area middle-school and high-school students. WHEN: 9 a.m.-2 p.m. on Friday, April 7, 2017. Doors open at 9 a.m. First race is at 10 a.m.
WHERE: The Reggie Lewis Center in Boston, 1350 Tremont St., Boston, MA 02120.
WHO: More than 1,000 middle school and high school student participants from 26 schools, including Boston Public Schools and the Greater Boston area. Some have rowed at Community Rowing, Inc. on the Charles River in Boston before, and some will be new to the activity. Former New England Patriots tackle Max Lane and Paralympic Silver Medalist Rower Jenny Sichel will be on hand for awards presentations. The Youth Erg Trials International — YETI — event was previously known as the Indoor School Rowing Championships. YETI features teams of students from middle schools and high schools in Boston, many of whom row in Community Rowing’s winter in-school indoor rowing programs. They will compete with each other on Friday in timed trials. More than 200 teams from Boston Public Schools will be participating, and visiting crews from Lawrence, Waltham, and Norwalk, CT, are also participating this year. About 300 students competed last year, and more than 1,000 will participate this year. The event will also feature rowing equipment demonstrations, yoga, tennis, and team oar design stations. Participating partners include Sportsmen’s Tennis and enrichment Center, Artemis Yoga, American Heart Association, and Massachusetts College of Art. Middle-school young men and women in mixed teams of four will each row for 90 seconds in the sprint competitions on indoor rowing machines. High-school students will row in relay races of mixed teams of three, each rowing for two minutes. Separate competitions will be held for teams from each school in grades 5 through 12. Community Rowing will provide 60 Concept2 indoor rowing workout machines for the event. Prizes include medals for top relay teams in each grade level, and there will be a full-size oar team trophy for the overall winning school. Lunches will be provided. Registration for the event will begin at 9 a.m., and competitions will take place from 10 a.m. to 1 p.m. The event is sponsored by Head of the Charles, the Micheli Center for Sports Injury Prevention, Polar Beverages, Stonyfield Organics, 88 Acres, Gentle Giant, and The Other Bean Hummus. For more information about registration, please contact Tiffany Macon at tiffany@communityrowing.org or 617.529.5941. For other information, please contact Kara White atkara.white@communityrowing.org or 508.254.9480. Community Rowing, Inc., based in Brighton, MA, is the largest nonprofit rowing organization in the United States, serving more than 7,000 youth and adults with a range of programs for beginners, recreational rowers, and competitive athletes. CRI promotes health and fitness for the entire greater Boston community, delivering after-school programs to urban youth, health and fitness programs to physically and mentally challenged members of the community, and learn-to-row programming for kids and adults. Programs include one-time learning-to-row classes to year-round memberships. 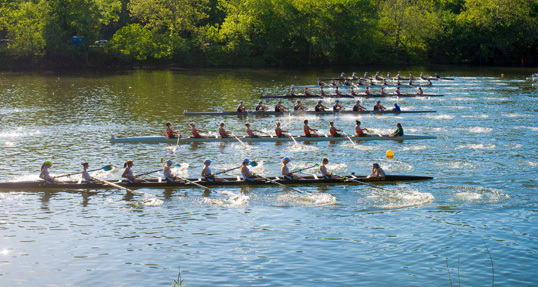 CRI was founded in 1985 by a group of Olympic and National Team Rowers with the goal of widening the circle of rowing and securing public access for the sport on the Charles River. Today the organization has more than 30 programs and a fleet of more than 170 sweep and sculling shells. Learn more at www.communityrowing.org .